Capsicums, or peppers to you and me. I love them! There is always a supply of green, red and sometimes orange peppers in my fridge. They make a great addition to stir-fries and salads, stuffed with flavoured rice before being baked in the oven or even as a handy snack with some chunky houmous! 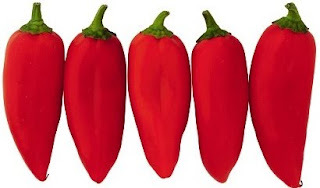 Despite the fact that I use peppers at least a couple of times a week, I still get annoyed at the fact that the pepper is packed full of little bitter seeds that need to cut away before use (and still manage to find their way into the meal). As a result I think that sometimes there is too much wastage on the noble pepper. 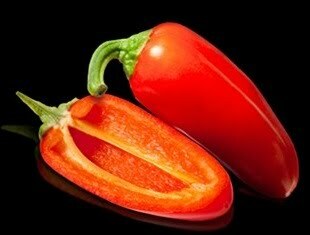 Now, thanks to a natural breeding process ,so no trace of GM, the world's first seedless pepper on the market. The award winning Angello Pepper has been developed by Syngenta, one of the world's leading developers of seeds and pesticides. The crops will be grown in Southern Spain, Israel and the Netherlands and has been cultivated to be extra sweet and extra crunchy. Look out for these baby peppers next time you're in your local M&S, the peppers are in stock now, priced at £1.79 per 100g pack. Love it!! - now all you need is how to get nature to grow the rice inside them and bobs your uncle - keep up the posts enjoying reading them and confess to feeling slightly peckish at times in reading them. Would be interested on yor views on what seems to be a new little establishment opened up on St Vincent Street called Martha's? - seems to do a mean little coffee to better the big chains and also seem to have some reasonable priced lunchtime deals! Thanks for the feedback. I've heard good things about Martha's, I'll need to check them out and get a review on for them. Good ask!